If you live in Sydney, you won’t have trouble finding numerous outdoor locations that provide perfect romantic atmospheres. Whether it’s luxurious, or more down-to-earth, you’ll always find something available. All outdoor Sydney locations book fast, though, so you need to think ahead. You also need to think about how your wedding entertainers can perform well in these outdoor locations. Who doesn’t want a wedding with spacious outdoor areas, gardens, plus an ocean view? Freshwater View Reserve is a true favourite for many people in Sydney. It’s along Freshwater Beach and offers stunning views of the ocean. Despite the views, it’s one of the most private places near a beach. You’ll find it hidden behind a large stone wall, but offering plenty of outdoor space for up to 100 guests. Your wedding entertainers would find this an enjoyable place to perform thanks to the wall and protection from the elements. While you’ll still need sound equipment, performers can safely perform while enjoying views of the ocean. Manly isn’t too far away where you can enjoy their restaurants for your dinner party. You’re going to find a lot of great outdoor wedding locations around Sydney Harbour. Bradfield Park Kirribilli is one such place that offers space along the water. Being directly under the northern pylons of the Sydney Harbour Bridge, it’s one of the most popular wedding places in all of Sydney. Call months ahead for a booking. Not far away from Bradfield Park is Captain Henry Waterhouse Reserve along Sydney Harbour. Another popular wedding spot, it offers a view of the harbour and the opera house across the way. To protect from the sun and other elements, your guests can congregate under a large tree available on the grounds. Your wedding entertainers and guests have easy access to the area by water taxi. Even closer to the water along Sydney Harbour is Bradley’s Head Amphitheatre. Being mere feet from the water, you’ll get even more spectacular views. For romanticism, it’s unbeatable, and holds up to 120 people. While you can’t bring a full wedding band here, one wedding singer can perform on the grounds for more intimacy. It’s possible to have a wedding near the harbour and still offer undercover areas. Balmoral Rotundais one of those offering more seclusion for your guests and wedding entertainers. The whole area of Balmoral has major history and offers stunning views near the harbour. With a park-like setting around you, it’s ideal for offering undercover protection and open nature. Moving on beyond the harbour, you’ll find some great beach locations as well. Mona Vale Headland is very popular and looks out over Bongin Bongin Bay and Mona Vale Beach. You’re high up here, so winds can become a factor. Nevertheless, with spacious grounds, wedding entertainers can find some calm spots to perform acoustically for you. 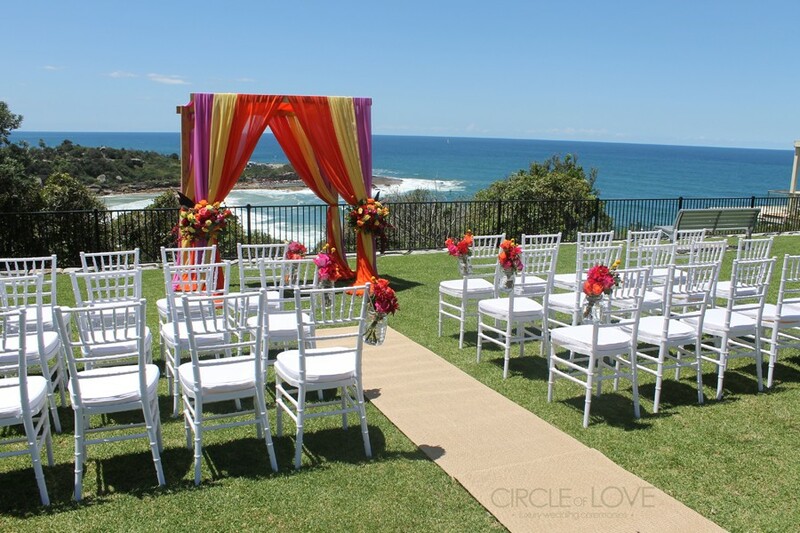 The Northern Beaches around Sydney are superb for any type of wedding. Shelly Beach is booked often, yet offers great beach views while being nestled in Cabbage Tree Bay. It’s in Manly, and the beach area offers electric barbecues for food service during your ceremony where you can hear your songs for weddings. A restaurant called The Boathouse is nearby to hold your wedding party later. They have facilities for wedding entertainment. There isn’t anything more romantic than having your wedding ceremony right near the ocean waves. Palm Beach offers plenty of beach space for this while offering restaurants within walking distance. It’s obviously more difficult for wedding entertainers to perform directly on the beach. So take advantage of the many restaurants and resorts nearby to set up your party. The Boathouse mentioned above isn’t far away from here. Arguably, Royal Botanical Gardens is the most popular outdoor spot for weddings in all of Sydney. Bennelong Lawn and Fleet Steps are two popular spots offering unobstructed views of Sydney Harbour and bridge. Plus, you have numerous lodges on the grounds where you can hold your evening party. They’re all equipped with state-of-the-art sound systems for a wedding singer or full band. Visit us at Lily Road where we can book the best wedding entertainment in Sydney for your outdoor wedding location.